Valentine's Day, we mean Feb. 14, is this Sunday, and for those of you who have people in your life who just hate everything about the lovey dovey "holiday," it's time to send them some love anyway. Of course, someone who is anti-Valentine's Day wouldn't expect a typical card, but these cards express exactly how they feel. 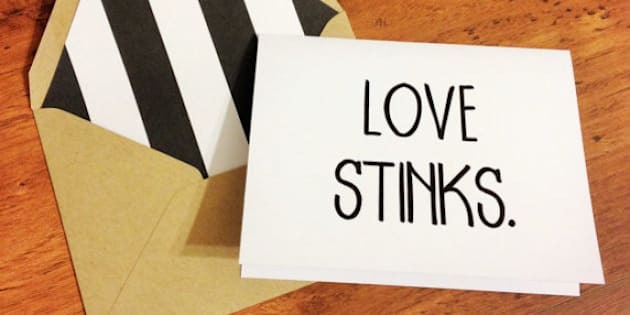 From the literal anti-love cards to ones that just include the middle finger, there's something in here for everyone. So yes, fill your commercialized-holiday hating friends' walls with one of these examples below. Get it at Cafe Press here. Get it at Mardy Mabel here. Get it at Squidge Face Cards/Etsy here. Get it at miumicat/Etsy here. Get it at Party Happier/Etsy here. Get it at Honest AF Cards/Etsy here. Get it at Dodeline Design/Etsy here. Get it at Just Wink here. Get it at Girl Party Shop/Etsy here. Get it at Death By Design Co/Etsy here. Get it at Nicole Marie Paperie/Etsy here. Get it Cafe Press here. Get it at Zazzle here.